From Belmond Hotel Caruso, Italy can be experienced in style. Each Suite is exquisitely furnished and spacious, creating a charm all of its own. Spacious marble bathrooms with oversized baths and showers provide peerless pampering, while stunning views are sure to inspire. 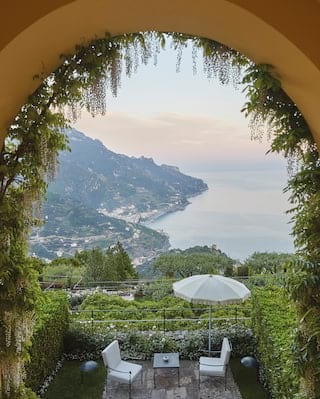 With unrivalled sea views, our Exclusive Suites offer complete decadence in picture-perfect Ravello. Stroll in the private garden, or soak up sweeping views from a terrace complete with sun loungers and a dining area. For even more space, two of suites can be connected to make a two-bedroom suite, ideal for families or friends. Recline on a sun-lounger and drink in breathtaking views of the Amalfi Coast from your own panoramic garden. As you step indoors from the terrace, light follows you in through expansive windows. Each suite enjoys an airy Mediterranean vibe with elegant Italian furnishings and antiques. Connect two suites together to form a spacious two-bedroom residence—perfect for family gatherings. Rooms feature a separate living space and a terrace equipped with sunbeds, a table and chairs. Combine with another Deluxe Suite for a large two-bedroom residence. Combining elegant design details with sumptuous furnishings, these suites epitomises Italian living. Expansive windows provide enchanting views of the village. Go all out on luxury. Book a Junior Suite or Suite and anticipate an unforgettable escape in Amalfi.